Easter is the most important festival to Christians throughout the world, but what is the Easter Story? Over two thousand years ago, Jesus had many enemies who wanted him dead. Jesus knew that he had only a short time left on this earth. The Thursday before he died, Jesus invited the disciples to have a last supper with him. It was their final meal together. “Father, forgive them. They know not what they do.” When Jesus died, his friends placed his body in a cave and covered the cave entrance with a rock. Jesus came back to visit his friends. He told them to teach about God’s love. “Tell the people,” said Jesus, “to believe in me even if they can’t see me.” And then Jesus went up to heaven to live with his Father. Christians believe that Jesus’ death and resurrection were part of a grand plan, engineered by God himself, to bring peace between God and the people of earth. Here is an interesting presentation of the Easter Story…the Lego Easter Story. My grandson Jack doesn’t think it’s as good as the Lego Batman movie, though. At Easter everyone gives Easter eggs and other Easter gifts, to wish each other a Happy Easter. At Brilliant Wall Art we have many unusual and interesting gifts for all the family. Why not spend a few minutes browsing our webpages, before visiting one of our exciting stalls? We offer a myriad of products and ideas. All our metal wall art items are carefully crafted from metal and are easy for you to wall mount. We have Easter presents for all your family and friends, ranging from metal wall art flowers, trees, fish, sailing yachts, lizards, painted glass, candle sticks, clocks etc...you will be spoilt for choice. 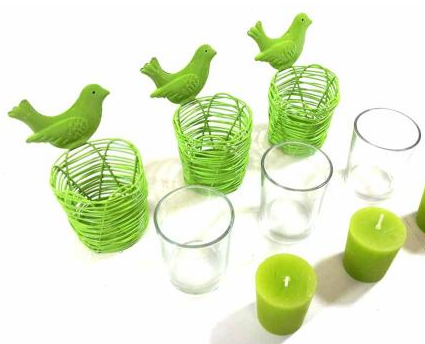 The set of three bird nest candle holders are an inspired choice as an Easter gift. Hand made from metal with glass filled candle inserts they are great as a set for an Easter table decoration. They are suitable for hanging inside or out. Come see us every Saturday at Stratford-Upon-Avon Market too. We're exhibiting some of our best-selling metal wall art, resin wall art, wooden signs and more, so hurry whilst stocks last.